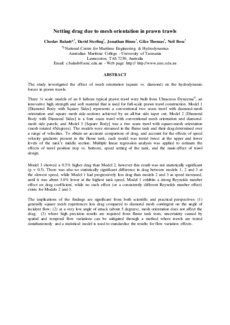 The study investigated the effect of mesh orientation (square vs. diamond) on the hydrodynamic forces in prawn trawls. Three ¼ scale models of an 8 fathom typical prawn trawl were built from Ultracross Dyneema©, an innovative high strength and soft material that is used for full-scale prawn trawl construction. Model 1 [Diamond Body with Square Sides] represents a conventional two seam trawl with diamond-mesh orientation and square mesh side-sections achieved by an all-bar side taper cut; Model 2 [Diamond Body with Diamond Sides] is a four seam trawl with conventional mesh orientation and diamond-mesh side panels; and Model 3 [Square Body] was a two seam trawl with square–mesh orientation (mesh rotated 45degrees). The models were streamed in the flume tank and their drag determined over a range of velocities. To obtain an accurate comparison of drag, and account for the effects of speed velocity gradients present in the flume tank, each model was tested twice: at the upper and lower levels of the tank’s middle section. Multiple linear regression analysis was applied to estimate the effects of trawl position (top vs. bottom), speed setting of the tank, and the main-effect of trawl design. Model 3 showed a 0.5% higher drag than Model 2, however this result was not statistically significant (p < 0.5). There was also no statistically significant difference in drag between models 1, 2 and 3 at the slowest speed, while Model 1 had progressively less drag than models 2 and 3 as speed increased, until it was about 3.0% lower at the highest tank speed. Model 1 exhibits a strong Reynolds number effect on drag coefficient, while no such effect (or a consistently different Reynolds number effect) exists for Models 2 and 3. The implications of the findings are significant from both scientific and practical perspectives: (1) generally square mesh experiences less drag compared to diamond mesh contingent on the angle of incident flow; (2) at a very low angle of attack (about 5 degrees), mesh orientation does not affect the drag; (3) where high precision results are required from flume tank tests, uncertainty caused by spatial and temporal flow variations can be mitigated through a method where trawls are tested simultaneously and a statistical model is used to standardise the results for flow variation effects.